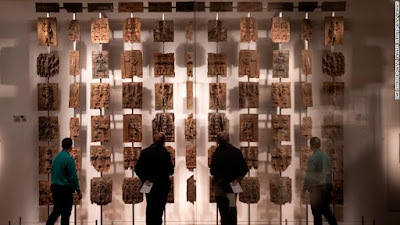 A deal was struck last month by the Benin Dialogue Group (BDG) that would see "some of the most iconic pieces" in the historic collection returned on a temporary basis to form an exhibition at the new Benin Royal Museum in Edo State within three years. The group comprises of representatives of several European museums, the Royal Court of Benin, Edo State Government, and Nigeria's National Commission for Museums and Monuments. "The key agenda item (at the October meeting) was how partners can work together to establish a museum in Benin City with a rotation of Benin works of art from a consortium of European museums," the spokesman said. "The museums in attendance have all agreed to lend artifacts to the Benin Royal Museum on a rotating basis, to provide advice as requested on building and exhibition design, and to cooperate with the Nigerian partners in developing training, funding, and a legal framework for the display in a new planned museum." "We are grateful these steps are being taken but we hope they are only the first steps," Crusoe Osagie, spokesman for the Governor of Edo, told CNN. "If you have stolen property, you have to give it back." The report from academics Felwine Sarr and Benedicte Savoy, prompted by President Emmanuel Macron's 2017 commitment to return African heritage, recommended that items taken without consent should be liable to restitution claims. Many of the estimated 90,000 artifacts of sub-Saharan African origin held at French institutions could be contested under the report's criteria. Sarr and Savoy further recommended that key, symbolic pieces long sought by claimant nations should be immediately returned - including several French-held Benin bronzes. France's example will increase the pressure on museums across Europe, which has been building on several fronts. Grassroots campaign groups within European countries are demanding restitution, such as in Germany, where 40 organizations recently signed an open letter calling for the return of historical artifacts. There is also growing recognition of the validity of restitution claims from a new generation of political leaders. Leader of the UK Labour party Jeremy Corbyn has said that if elected, his government would be willing to discuss the return of "anything stolen or taken from occupied or colonial possession." Museums are also facing a raft of increasingly determined claims from the governments of dispossessed nations across the world, from sub-Saharan Africa to Greece's claims for the Elgin Marbles, to Chile's appeal for Easter Island statues. Few longstanding observers of a saga that has been taking place since the end of the colonial era expect these matters to be resolved quickly. President Macron's initial commitment to return just 26 pieces suggests a long term process.